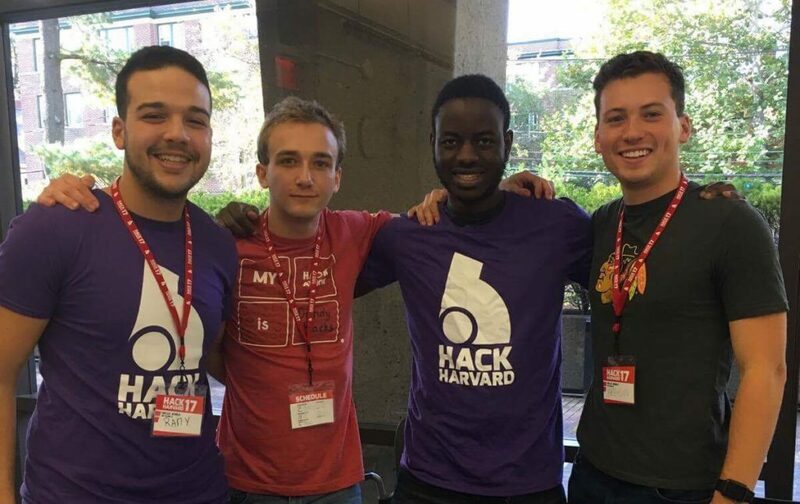 Victory Omole (center right) with his QHacker teammates at Hack Harvard 2017. Victory Omole knew he wanted to attend Iowa State University from the moment he visited campus. It was the only university he applied to because he knew the Electrical and Computer Engineering (ECpE) department had an excellent computer engineering program. Victory was born in Kenya, but moved to the United States with his parents and younger siblings in 2006. Now a senior at Iowa State, Victory said he has many great memories from his college career. He enjoyed living with fellow ECpE students in the dorms his freshman year and has made other memories with those friends since, from late night McDonald’s runs to studying in Parks Library until midnight. Victory said his biggest accomplishment at Iowa State has been learning how to build programming languages. “I am thankful that Iowa State gave me the resources to go from not knowing how to program to building toy programming languages in less than two years,” he said. Just last year, Victory helped found a group called QCHackers, composed of five undergraduate and graduate students from all around the country. They study quantum computation and build software tools that developers can use to learn and program quantum computers. QCHackers also won the hacker prize at Hack Harvard 2017. Their project, titled, “Visualizing Quantum Algorithms on the Web Browser,” helps people envision how quantum algorithms work by seeing how a state vector looks when a quantum gate is applied to a qubit. After his upcoming graduation in May, Victory plans to work for a quantum computing company. He is motivated by building computers that can simulate the laws of quantum physics efficiently. He hopes these computers will make it easier for scientists and engineers to stay on top of cutting-edge research. “I’m looking forward to witnessing the scientific advancements that will occur in the field of quantum information science,” Victory said. For younger students, Victory encourages them to explore their interests and other fields.